Back pain, one of the most common complaints doctors hear from adult patients, is a real and prevalent reality for practically everyone. From strains associated with physical labor jobs, to overuse injuries associated with exercising, to simply bad posture habits that cause spinal compression – back pain can stem from a variety of sources. The good news? Many of the risk factors for back pain are indeed preventable with basic lifestyle modifications. Updated recommendations from the American Medical Association suggest clinicians should actually resort to medicinal avenues for treating back pain only after natural remedies like yoga, spinal manipulation, exercise, and acupuncture have been attempted. Forward Head Syndrome, or the phenomenon associated with increased use of digital devices, refers to the forward craning of the head and neck past the shoulders when looking down at your smartphone or computer. 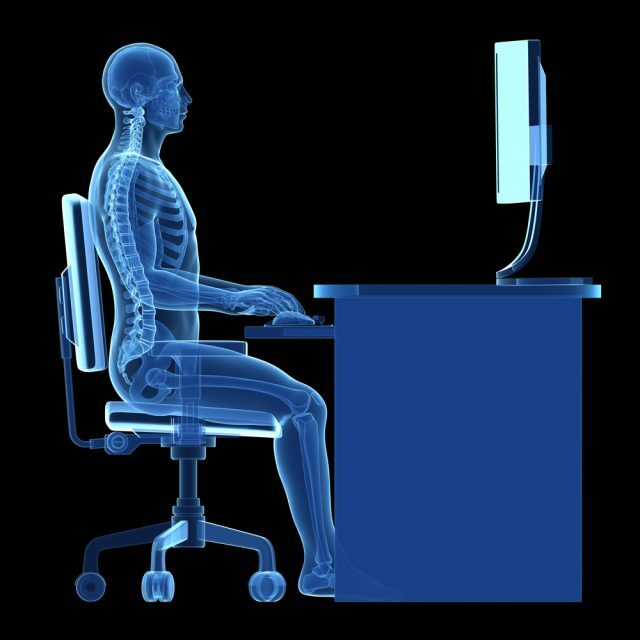 Common among office employees who spent multiple hours a day at a desk working on a computer, forward head posture has been shown to increase the pull on neck and back muscles by 10 to 30 lbs! Have you heard? Sitting is being called the “new smoking” after 2017 study results revealed prolonged sitting can lead to early death. Almost 8,000 adults over 45 years of age were tracked for an average of 4 years and researchers found that those who spent the most time sitting each day, especially those with the longest periods of sitting over 60 minutes, had increased risk for higher all-cause mortality – even if they exercised regularly. If increased risk for dying early doesn’t get you off the couch, lower back pain associated with prolonged sitting may just do the trick. Chronic muscle aches in the lumbar spine region might have you heading to the medicine cabinet or grabbing an ice pack each afternoon, and the culprit could be how you sit and for how long. Extended sedentary behavior leads to poor posture habits like hunching and slouching which amplify the amount of pressure placed on vulnerable discs in the vertebrae. If you find yourself unable to avoid sitting for an extended amount of time, i.e. while driving on a long car trip, use helpful aids like lumbar pillows and seat cushions to better support good spine alignment and weight disbursement – click to see more. While your feet might seem like the last concern you should have regarding your back pain, it turns out they are very much connected. The kinetic chain linking your feet and your own back health starts with analyzing how you walk, and how you walk is very much dependent on the type of footwear you choose to wear. For example, high heels are prominently discouraged by medical professionals and chiropractors for their negative effects on gait. In addition to squeezing the toes into a narrow point which can cause it’s own set of foot problems (i.e bunions, hammer toes, etc), high heels actually thrust the hips forward, diminishing the support of your lumbar spine’s natural inward curve, throwing hips off balance, altering your center of gravity, and placing unnecessary stress and strain on back muscles. On the other hand, flip flops with absolutely no arch support can disrupt proper pronation as well leading to unwanted foot, knee, and back pain too. For athletes, footwear that supports fluid ankle movement and a strong arch is going to both help prevent back pain as well as potential injury. Runners who train in worn out running shoes risk developing everything from back strain to runner’s knee, plantar fasciitis, and Achilles tendinitis. Above all, it is widely recommended that those recovering from back strain or who are looking to prevent future back pain should stay active and exercise regularly to boost muscle elasticity and circulation. Low-impact exercises which are easier on the joints and great for back health may include hiking, dancing, swimming, yoga, cycling, rowing, and light weight-lifting. The more proactive you are day in and day out about reinforcing strong back health, the more likely you are to avoid pain down the road. We are here tomake people aware of the importance of Yoga and Ayurveda and natural healthy lifestyle. You don’t have to do yoga specifically if you don’t want to – any kind of exercise will help tremendously with exercise, especially weight lifting/resistance training. Strengthening your back muscles helps a lot with reducing or eliminating back pain.